The Mitten Park Fault is located on the Green River. The Green River runs through The Gates of Lodore. 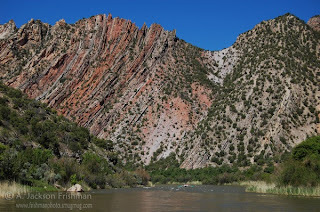 Some of the rocks found on the river are part of the Precambrian time period that date back to long before dinosaurs, about a billion years ago. As you enter the "gates" the river cuts through the Uinta Mountain Group rock formation. As the river continues and leaves the Canyon of Lodore it is exposing the south end of the Uinta Arch. As a result younger layers like the Lodore, Madison, Weber Sandstone and many more layers come into view. Also, this is where you will find the spectacular Mitten Park Fault. Before this river ran through the canyon, while the final formation that we see today was forming, an amazing thing happened. The layers of rocks were already there and deposited, but then an event took place that would make the perfect have-to-see site. It formed when the Uinta Mountains were lifted up 60 million years ago. While one side was being drug down, the other was being drug up, creating what we call the drag of the fault. The layers of the earth's crust that normally run horizontally turned upwards. This is definitely one of the coolest things about the fault. The only thing that could almost compare to how cool the drag is, is watching the layers jump around. One side has different rocks in different locations than the other side. This makes it so the rock layers don't line up with the other side. It's like having a whole new view of the mountain, but you only have to turn your head slightly to get it.